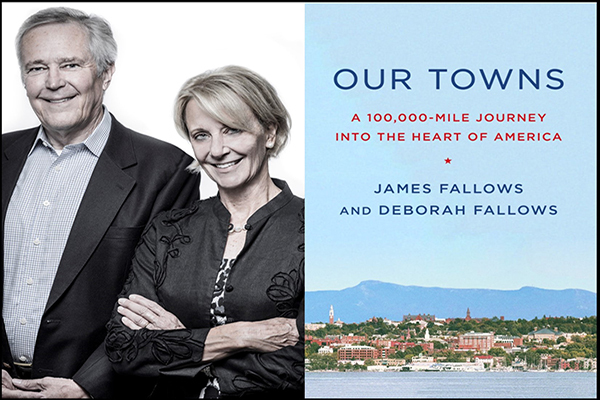 James and Deborah Fallows, acclaimed authors and correspondents from Atlantic magazine, bring their unique perspective on small town America as described in their new book Our Towns: A 100,000 mile journey into the Heart of America. For the past five years they have been traveling across America in their single-engine prop plane, visiting dozens of small towns. They have met hundreds of civic leaders, workers, immigrants, activists, librarians, artists, elected officials and many more. They found an America that is well aware of its problems, but also a citizenry crafting solutions with a practical minded determination at dramatic odds with the bitter dysfunction at the national level. Our Towns describes the dreams and determination of many who are in the midst of making things better.